Art historians consider the Pórtico de la Gloria to be one of the most remarkable monuments of Romanesque art. In 1866 the Museum commissioned Domenico Brucciani (1815–80) to cast it. Brucciani was one of a number of Italians who produced plaster reproductions of artworks in London in the mid-19th century and he made some of this Museum’s most prized casts. Brucciani and his team journeyed to Spain to cast the Pórtico directly. They would have used gelatine moulds to capture the intricate detail of the carvings. The team managed to complete the work in just two months, a record time given the size and complexities of the sculpture and this moulding technique used. The intricate carvings that cover the Pórtico tell the biblical story of the Last Judgement and show prophets,saints and angels. The width of this copy of the Pórtico is just over 41 metres. It probably determined the dimensions of the Cast Courts, first known as the Architectural Courts. The courts were purpose-built in 1873 to provide space for this and other monumental casts from around the world, like Trajan’s Column. Plaster cast of the Pórtico de la Gloria, in stone, known as the Puerta de la Gloria, with representations of Christ in Majesty surrounded by the Evangelists, Angels bearing the Symbols of the Passion, the Apocalyptic Elders, St. James the Greater, the Apostles and the Prophets, from the Cathedral of Santiago de Compostela. By the Master Mateo (who is shown crouching on the reverse of the central column). 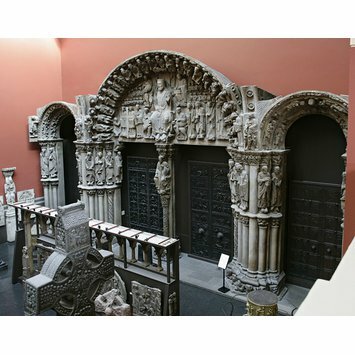 Cast of the Pórtico de la Gloria created in Santiago de Compostela, Spain, in 1866 by Domenico Brucciani and commissioned by the Museum from Domenico Brucciani at a cost of £2300 who used used gelatine moulds and completed the work in just two months. The cast is of the original Pórtico de la Gloria, which was sculpted by Master Mateo in Santiago de Compostela in 1188 for the Cathedral of Santiago de Compostela. 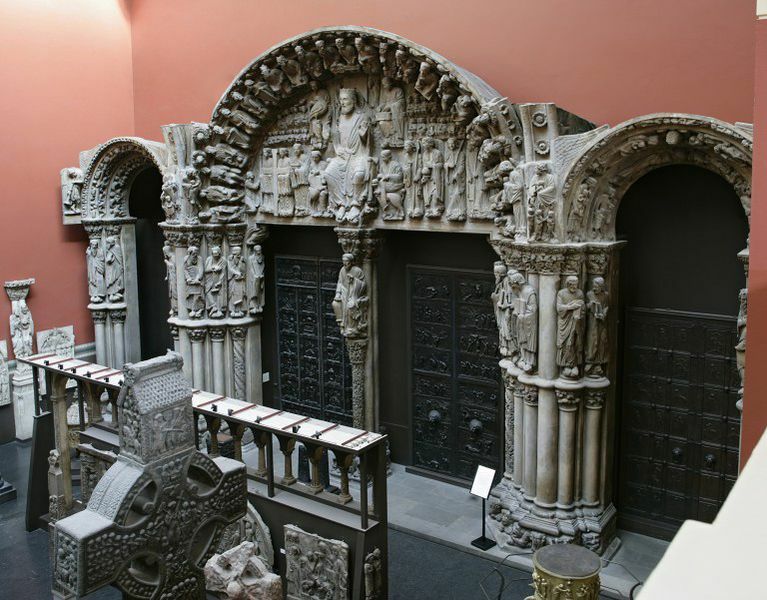 Plaster cast of the Pórtico de la Gloria by Domenico Brucciani in 1866, depicting the original Pórtico de la Gloria made by Master Mateo in Santiago de Compostela, Spain, in 1188. Trusted, Majorie. ed. The Making of Sculpture: the Materials and Techniques of European Sculpture. London: V&A Publications, 2007. p. 160. pl. 308. Cormier, Brendan and Thom, Danielle, eds. A World of Fragile Parts, London, 2016, p.17. The Pórtico de la Gloria at the Cathedral of Santiago de Compostela in Galicia, Spain, dating from the late twelfth century, has long been recognized as one of the great monuments of romanesque art. In 1866 the Museum commissioned a plaster cast to be made of it. This was triumphantly realized in Santiago by the plaster cast maker Domenico Brucciani (1815-1880). Brucciani, a native of Lucca, had come over to London from Italy in the 1840s to join his uncle, a plaster cast manufacturer. He later set up a plaster casting business in Covent Garden, and worked for the South Kensington Museum from 1853 or 1854 onwards. He was one of a number of Italians who produced plaster reproductions of works of art in London in the mid-nineteenth century. The width of the copy of the Pórtico, just over 41 metres, probably determined the width of the Cast Courts (then known as the Architectural Courts), which were built in 1873 to house it. Brucciani and his team of workmen made an arduous sea voyage to Spain in 1866 in order to cast the Pórtico, and remarkably completed the work in two months. The scene represented on the tympanum is derived from on the biblical Book of Revelation. In the centre, Christ in Majesty displays his wounds, surrounded by the four Evangelists. At each side of the Evangelists are four angels holding the instruments of the Passion. Above are two groups of blessed souls. In the archivolt are seated the Elders of the Apocalypse, playing musical instruments. Below, in the centre, the figure of Saint James the Greater (Santiago), patron saint of the cathedral, and of Spain, is shown seated, holding his pilgrim's staff. Beneath the Apostle is the Tree of Jesse, the family tree of Christ as descended through King David, the first time that this subject had been represented in Spanish art. At the base of the central column, looking towards the high altar of the cathedral, is the kneeling figure of the artist himself, Master Mateo, holding a tablet inscribed ‘Architectus’.